Every once in a while I get out of the kitchen and make way for my Sous-chef dishwashing mom to create something wonderful! That is exactly what happened recently after she was leafing through the fall Southern Living magazine and came upon this recipe. The minute she saw it she knew it was meant for us! Even though I adore Southern Living magazine, I leave it to mom to let me know what I need to see and read! We have several cast iron skillets — and even though skillet is well-worn and not too pretty — oh my what a nicely browned, flaky crispy crust it makes! This recipe works in a regular pie plate, but dig out the cast iron if you have one. 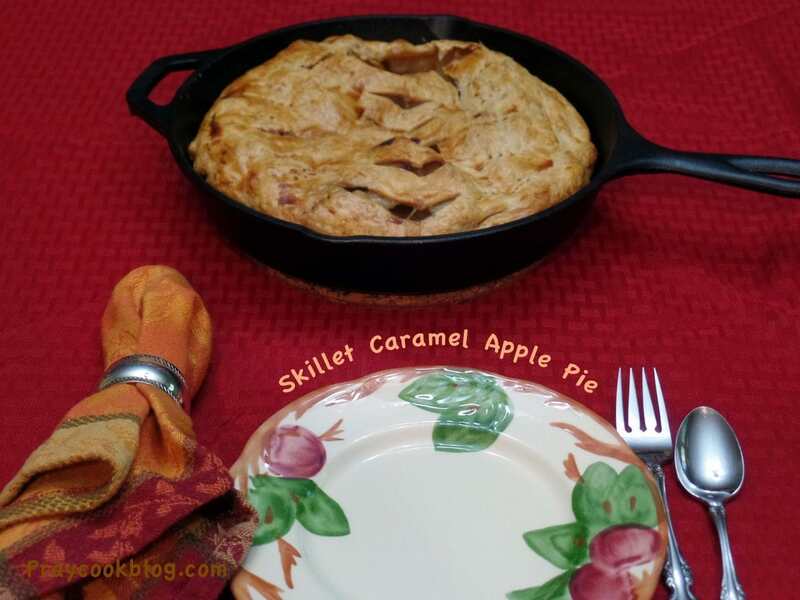 I was reading through the recipe before typing this blog post and I read “The rich, bourbon-y caramel sauce makes the tender, lightly spiced apple filling, and flaky crust even more irresistible.” Whaaat? Bourbon? Maybe Jack Daniels? Hmmm …. 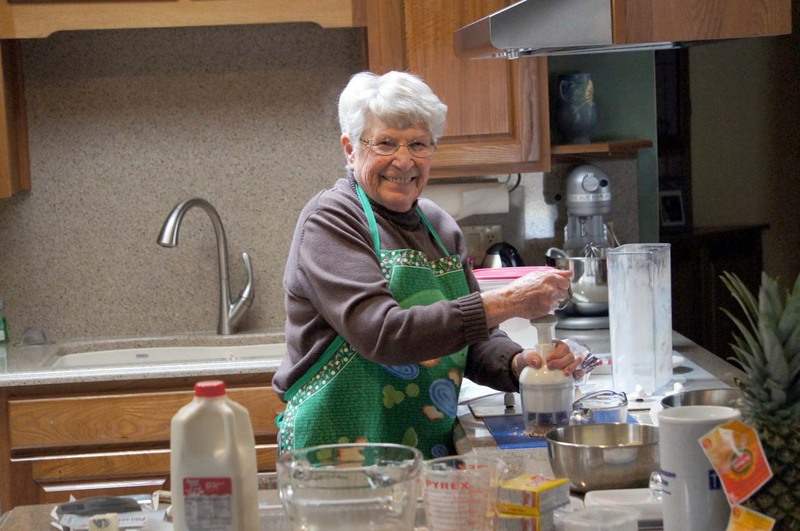 I am going to have a little chat with my Sous-chef Apple-pie making momma because I am pretty sure she didn’t include a local hometown ingredient. (Have I ever mentioned that we live only a couple of miles from the only place on earth where Jack Daniels Whiskey is made? ) I am sure we are now going to need to make another one and include a little Jack. Maybe their Tennessee Honey. Yum. The recipe calls for Fuji apples. Mom used Fuji. 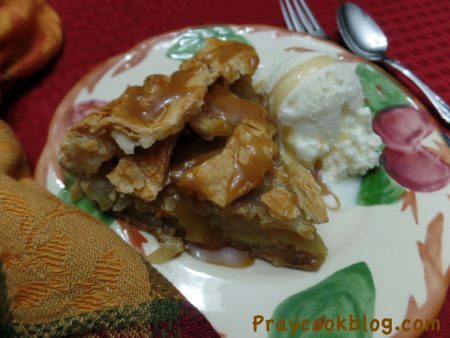 Although this recipe works made with most apples, you will want to get the Fuji if you can because the tart-sweet flavor works well with the sweet caramel, and the apples hold their shape when baked instead of turning to mush. 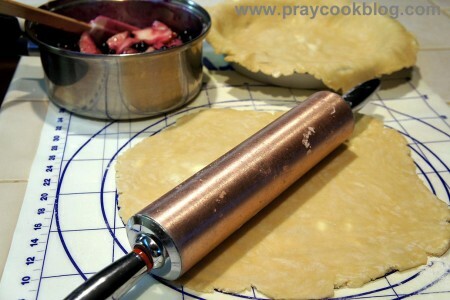 Flaky Pie Dough, Part 2 Tips and Tricks! Mom was concerned that the pie crust wouldn’t stretch up and over the skillet edge. We discovered it really doesn’t need to. Just place the crust in the skillet up to the edge and gently fill. 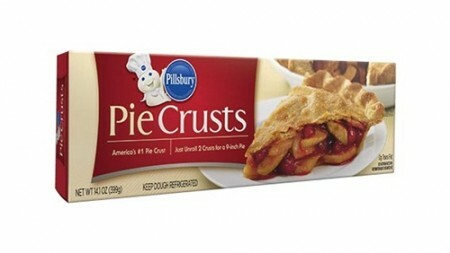 Then when placing the top crust crimp edges of bottom and top crusts together. Place the skillet in a preheated oven on the middle oven rack until the crust is golden, the apples are tender, and the filling is bubbly, about 55 minutes to one hour. IMPORTANT: Cover the pie loosely with aluminum foil after about 40 minutes to prevent excessive browning — or earlier if the pie begins to over-brown on the top. Let the pie cool completely before serving to allow the filling to set. This is also important so that each piece will come out picture perfect! Besides the really flaky crust, the homemade salted caramel sauce is what separates this pie from all the rest! The caramel sauce goes in the pie and on top of the pie! Oh my goodness, can’t you just taste it? 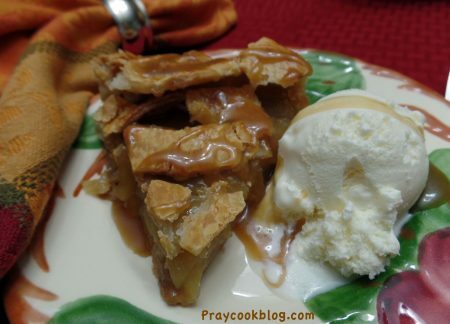 Top each serving with a scoop of vanilla ice cream and extra caramel sauce, there is plenty to go around! Thank you to my Sous-chef Dish-washing Apple pie-Making momma for this wonderful dessert! 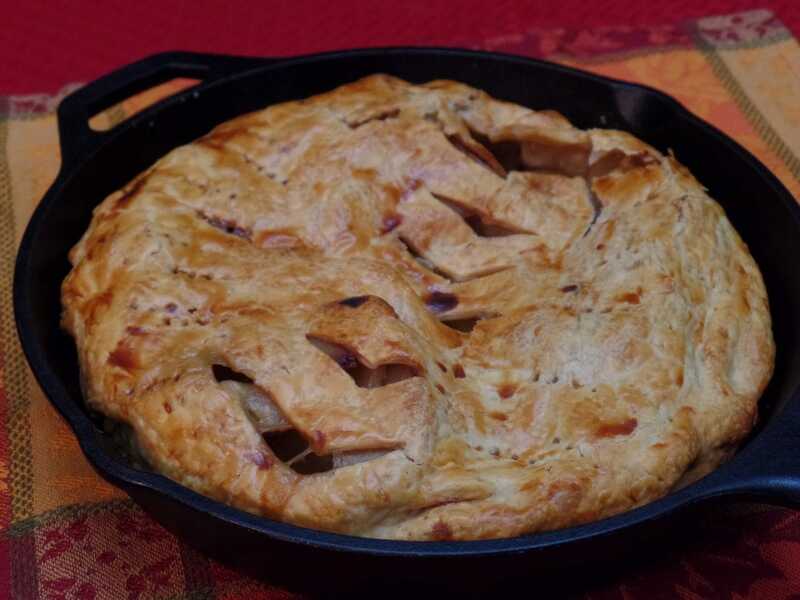 Nothing says "southern" quite like making an all-American apple pie in a cast iron skillet! Top it with homemade caramel sauce and you will be the talk of the town! Fit 1 piecrust on the bottom and press up sides of a 9-inch cast-iron skillet. Transfer skillet to refrigerator, and let chill while assembling caramel sauce and apple filling. Stir together light brown sugar, butter, half-and-half, and salt in a medium saucepan over medium-high. Cook, stirring, until butter melts and mixture begins to bubble, about 5 minutes. Cook, stirring, until mixture begins to thicken, about 2 more minutes. Remove from heat; stir in vanilla extract, and, if desired, bourbon or whiskey*. Let caramel sauce cool to almost room temperature, about 30 minutes. Toss apples with cornstarch in a large bowl. Pour ⅓ cup caramel sauce over apples, and toss to coat. Reserve remaining caramel sauce for serving. Pour apple filling into prepared skillet. Place remaining piecrust over apple filling. Crimp edges of bottom and top crusts together. Using a sharp knife, cut 6 to 8 (1-inch) slits in top crust for steam to escape. Whisk together egg yolk and water in a small bowl; brush over crust. Bake pie in preheated oven on middle oven rack until crust is golden, apples are tender, and filling is bubbly, about 55 minutes to 1 hour, shielding loosely with aluminum foil after about 40 minutes to prevent excessive browning. Transfer pie to a wire rack, and cool completely, about 3 hours. Serve with reserved caramel sauce. *Bourbon or Whiskey optional for a little boozy-flavoring. So are you the dish washer when your mom cooks? No, I don’t do the dishes. Bad daughter!